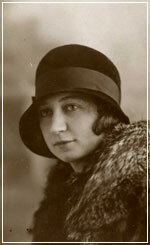 On Monday evening, January 11, Miep Gies deceased after a short illness. She has become 100 years. Miep Gies reading the incoming letters, June 2001. Photo: Bettina Flitner. During the Second World War, Miep Gies, along with Johannes Kleiman, Victor Kugler, Bep Voskuijl, Jan Gies and Johan Voskuijl, made up a team of helpers for the eight Jewish people hiding in the Secret Annex at Prinsengracht 263 in Amsterdam. The office of Otto Frank, where Miep worked as secretary, was located at the front side of the same building. Following the betrayal and the deportation of the hiders, Miep and her colleague Bep made sure that the diary of the youngest of the group, Anne Frank, did not fall into the hands of the German occupier. Miep stored Anne's writings in a drawer of her desk, unread, and gave them to Anne's father when he returned after the war, as the only survivor of the concentration camps. He saw to it that Anne's legacy was published in 1947 with the title Het Achterhuis (The Secret Annex).